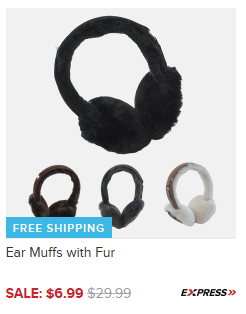 Ear Muffs with Fur Only $6.99 + FREE Shipping (Reg. $30)! You are here: Home / Great Deals / Ear Muffs with Fur Only $6.99 + FREE Shipping (Reg. $30)! I love earmuffs! I think they are cute, yet very functional! Grab a pair of these trendy Ear Muffs with Fur for only $6.99 + FREE Shipping (Reg. $30) right now! Constructed of warm, soft fur and made of 20% leather and 80% polyester, these one size fits most earmuffs are a staple to your winter gear. They have several colors to choose from, too!